The continued functioning of the PLO via the reformation of the Palestinian National Council, together with elections to the presidency and the parliament. The holding of a second meeting of the ad-hoc committee on revitalizing the PLO in Cairo on February 18. To continue the activity of the committees set up by the reconciliation document signed by the two sides in Cairo in December, namely: the Public Freedom Committee, which is authorized to deal with the release of prisoners, the opening of institutions (including Hamas charitable societies) that were closed during the period of hostility between the sides, the return of Fatah activists to Gaza, the issuance of passports, and freedom of action; and the Community Reconciliation Committee, which is to deal with compensating the families of those killed in the violent clashes between Fatah and Hamas. On the background of the signing of the agreement, Abbas announced as a confidence-building measure the release of 64 prisoners from Palestinian Authority (PA) prisons in the West Bank. Although the identities of the released prisoners have not been made clear, probably most of them belong to Hamas, given its strong demand to free all the “political prisoners” as an essential condition for reconciliation between the sides. 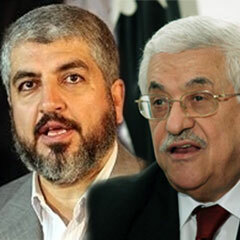 Hamas sees no political significance in the envisaged Abbas-headed transition government. This is evident from the fact that its powers are limited to carrying out the presidential and parliamentary elections and working to rehabilitate Gaza. From Abbas’ perspective, his appointment as prime minister, in addition to president, will enable him to maintain the international recognition of the Palestinian government despite the agreement with Hamas, and give him room to maneuver in contacts with the international community, both politically and in terms of keeping the aid money flowing. The Doha Declaration, like previous Fatah-Hamas agreements, emphasizes the need to implement the agreements between the sides – once again demonstrating the difficulty of achieving institutional unity in the Palestinian arena in light of Hamas’ declared ambition to assume senior status in representing the Palestinian people. The two sides will have to show great creativity to overcome the many obstacles facing the holding of elections, from unifying the separate civilian and security institutions in the West Bank and Gaza, to budget allocations. Abbas’ cooperation with Mashaal, and his uncompromising refusal to meet with Israeli Prime Minister Benjamin Netanyahu, illustrates the strategic choice he has made. He does not prefer the path of a political settlement but, rather, to link up with Hamas and the other regional forces emerging in the Arab Spring and thereby use them as a force multiplier against Israel without having to offer political concessions. The release of the 64 prisoners is not only a gesture to Hamas but also an implicit message that the security cooperation with Israel is secondary in Abbas’ eyes to the old-new alliance with Hamas.